Did you guys know that SFEtsy is doing another amazing Flash Sale? Save the date, June 3, 2013! *This is a special evening Tweet Chat for those who can not join us in the mornings! 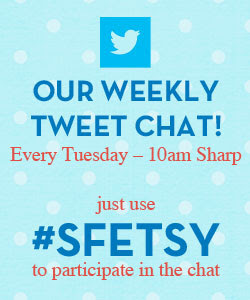 If you like to use tweetchat.com to follow our chats this is the link tweetchat.com/room/sfetsy. We use the hashtag #SFEtsy! 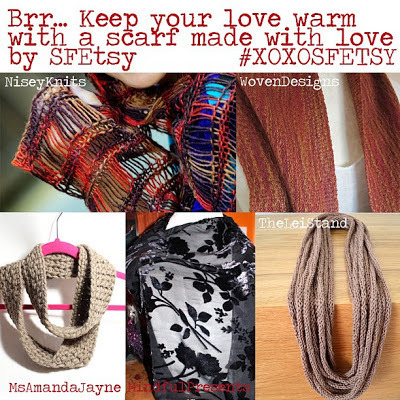 Keep your eyes out for the #SFEtsy hashtag! Right now as a member of SFEtsy, you can participate in the flash sale! We will market your shop your shop and teach you to market yours and others!! We will be Tweeting, Pinning, FBing and also Instagramming select participants throughout the day of the sale with a link show all featured shops! 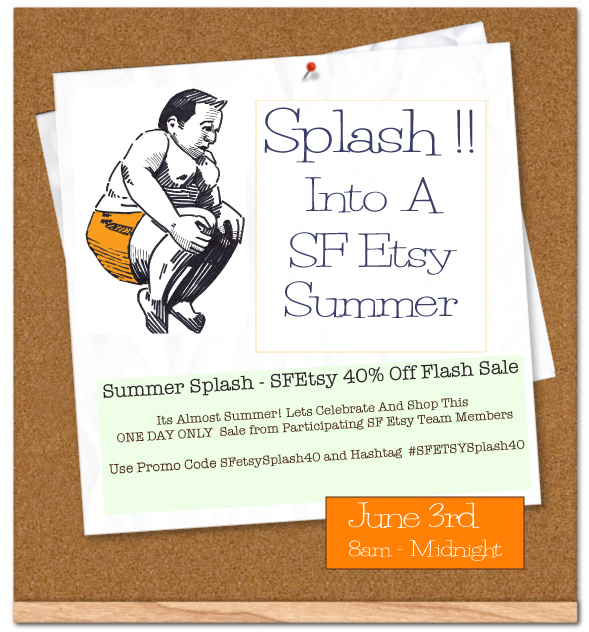 Promo code: Members are to use the coupon code SFetsySplash40 and Use the #SFETSYSplash40 as a tag in order to search on Etsy for all these great deals! 1.) Register here: Participate in SFEtsySplash40 by May 28th. Late participants will not get the same focus as the people who sign up early so take advantage of the early sign up. 3.) On the day of the sale: Please share the flier (which we will also post on the Facebook Fan Page ) and let people know that SF ETSY & Your store are having a one day only sale! Sell, Sell, Sell! Share, RT, Heart and Follow! This event is more successful when people reciprocate the LOVE! 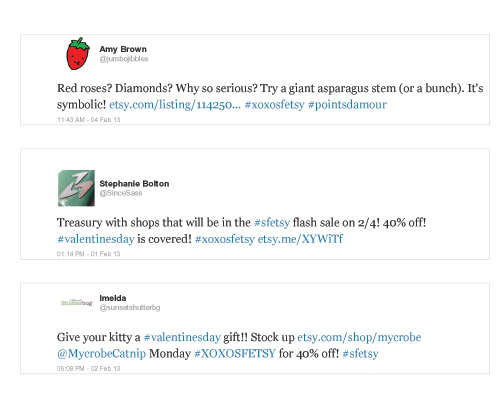 Twitter: Take a peek at what some SFEtsy Members marketed our last Flash Sale, #XOXOSFETSY! Use twitter in a creative way! No time to tweet? Learn all about setting up future tweets! We can teach you how at the tweet chat! Instagram: Reach more viewers with photos! A great way to impact more shoppers is using Instagram for marketing your shop! We will have a brief chat about Instagram in our upcoming tweet chats! Etsy Treasuries: Create a treasury for Etsy. Who knows, maybe we can reach the front page! We can't wait to help you learn about how to market your shop via social media and of course get some awesome sales! and we are SFETSY on Instagram! If you have additional questions about the SFEtsySplash40 Flash Sale, please contact Lisa Spinella, SFEtsy Social Media Team Leader (@TickleandSmash or @sfetsy).